Be sure to check out this other bite on the same topic. If these close-in planets are so common, why doesn’t our solar system have any? Today’s paper by Christopher Spalding blames the Sun itself for the void of planets within Mercury’s orbit! Whereas a previous paper we covered on Astrobites proposed that the building blocks of planets (called planetesimals) may have never formed at less than 0.3 AU, Spalding instead argues that the Sun would have blown away all of the smallest planetesimals in this region with its powerful solar wind. With fewer building blocks left so close to the Sun, it would have been a lot more difficult for planets to form there. The Sun is the heart of our solar system. It rests at the center illuminating all of the planets behind the the beat of its nuclear fusion core. However, it also pumps a solar wind of charged sub-atomic particles in all directions into the rest of the solar system. This deadly solar wind consists of protons, electrons, and alpha particles ejected by the Sun’s magnetic field. When these particles hit the Earth’s atmosphere, they can spark aurorae near our northern and southern poles. If we were not protected by an atmosphere, life on our planet would be in grave danger. Mini-planetesimals in the young solar system faced an even greater danger. A long time ago, the Sun was much more powerful. Shortly after it formed, the Sun possessed a stronger magnetic field and a faster rotation rate, both of which helped fuel a solar wind that unleashed about ten times more mass than it does today. When planetesimals passed through this wind, the outward motion of the medium of charged particles helped carry the planetesimals with it and away from the Sun. (The force of a medium such as the solar wind altering the motion of an object passing through it is known as ram pressure.) Naturally, smaller planetesimals would have been easier to carry away. What sized objects are affected by the solar wind? In the paper, Spalding integrates the equation of radial motion for three different-sized “mini-planetesimals” (10 m, 100 m, and 1000 m) as they are driven out by the solar wind. The planetesimals start at 0.1 AU and are integrated for 100 million years, at least twice as long as it took for the Earth to form. In these simulations, Spalding finds that the larger 1000 meter-sized objects are only pushed out to 0.2 AU over the full 100 Myr timespan. 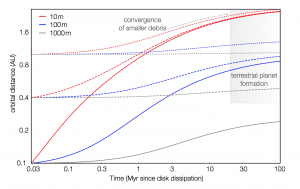 However, the 100 meter-sized mini-planetesimals are dragged out to beyond 0.3 AU in just 3 million years (see Figure 1), preventing them from being able to contribute to the growth of potential rocky planets interior to Mercury much later on. Figure 1. Distance from the Sun of mini-planetesimals (10 m, 100 m, 1000 m) over time. They start at 0.1 AU in the fiducial case; other cases that start out at 0.4 AU and 1.0 AU are shown for comparison. For planets to form interior to Mercury, it would be helpful if the mini-planetesimals can stay at less than 0.3 AU for at least 25 Myr (the area below the gray box on the right). Fig. 4 of the paper. How much material is lost? Even though there are a lot more small objects than big objects, most of the combined mass between all of the planetesimals in orbit is contained in the larger objects. As a result, if there are a lot of larger planetesimals, it might not matter if all of the smallest planetesimals are driven away. However, Spalding suggests this may not be an issue if Jupiter was responsible for supplying the region with planetesimals in the first place. It is widely accepted that once gas giant planets form in a disk, they will migrate away from where they formed, usually closer to their stars. As we discussed in another bite, it has been proposed that Jupiter may have migrated very far in the solar system all the way in to 1.5 AU before the later formation of Saturn tugged the planet back out to its current location of 5.2 AU from the Sun. While Jupiter was visiting the inner solar system, it would have taken a huge supply of planetesimals with it – possibly even 10 to 20 times the mass of the Earth. If this scenario indeed occurred, the vast majority of planetesimals within Mercury’s orbit would have been the result of Jupiter’s visit to the inner solar system. If these planetesimals had their orbits altered enough to go from the outer solar system to much closer to the Sun, the largest ones would have also been prone to collide with each other and break apart! Much larger planetesimals at least 100 kilometers in size would “grind themselves down” to 100 meters in size through these collisions, greatly increasing the amount of mass affected by the solar wind. Spalding finds if all of the planetesimals larger than 100 kilometers were destroyed and broken down into smaller objects, at least 0.1 Earth masses worth of mini-planetesimals would be driven out of the region within Mercury’s orbit (see Figure 2). That is equivalent to twice the mass of Mercury itself. Figure 2. Total amount of mass lost interior to Mercury (assuming objects up to the “size in color” are lost) as a function of the size of the largest planetesimals. The red line (100 m) is the most relevant since this is near the maximum size at which mini-planetesimals no longer survive. 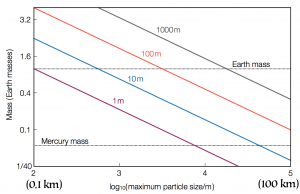 If the largest planetesimals are 100 km, two Mercury masses of material are lost. Adapted from Fig. 5. With all of the material smaller than a few 100 meters removed from within Mercury’s orbit, the planet formation process may have been too slow for an object in the region to grow to planet-size. Rocky planets like Mercury and the Earth originally formed from large embryos (>1000 km across, or bigger than the largest asteroid Ceres) colliding and merging with both each other and smaller planetesimals. Without the population of smaller objects, these embryos and their components would have had fewer objects to collide with. As a result, collisions would happen at a slower rate and it would take longer to build up a planet-size object. However, if this process takes too long, Mercury and the other planets that already formed would have time to gravitationally alter the orbits of the larger embryos, potentially kicking them out of the solar system or causing them to collide with other planets. Combined with the effects of the solar wind, this would leave neither really small objects, nor really big objects interior to Mercury, making it impossible for planets to form. Our previous bite on this topic suggested that there are no planets closer to the Sun than Mercury because planetesimals (10 to 100 km) never formed in this region. Today’s bite instead asks the parallel question of what would have happened if a population of planetesimals and smaller “mini-planetesimals” (10 to 100 m) from elsewhere were placed in the region by Jupiter migrating much closer to the Sun. It then answers that question by arguing the population of smaller objects would be removed due to the power of the primordial solar wind. All in all, it is interesting to see two totally different approaches to a problem that when better understood, should provide some insight into whether our solar system is truly unique. Forming Mercury and Iron-rich Exoplanets Mercury’s surprising density: What about magnets? Plutonian craters to be named after Star Trek characters Why is Mercury so far from the Sun?